Orbital power stations—or satellites that absorb solar energy and beam it back to Earth—are permanent fixtures of science fiction. Now, Japanese researchers working for Mitsubishi are one step closer to making them reality. Using a system of high-capacity wireless microwave energy transmitters, the scientists were able to send 10 kilowatts of energy around 1,600 feet, which is still a far cry from the required 22,000 mile range. It’s worth noting that neither the distance nor the power level is a record of any sort; NASA testing in the mid-Seventies boosted around 30 kilowatts almost 5000 feet at better than 80% efficiency. Mitsubishi hasn’t mentioned the efficiency level of their transmission, but they claim that their tests validate the control system technology, which keeps the transmitter aligned with the receiver. The size and shape of the antennae also signal progress; being that they are considerably smaller and lighter than those previously used. 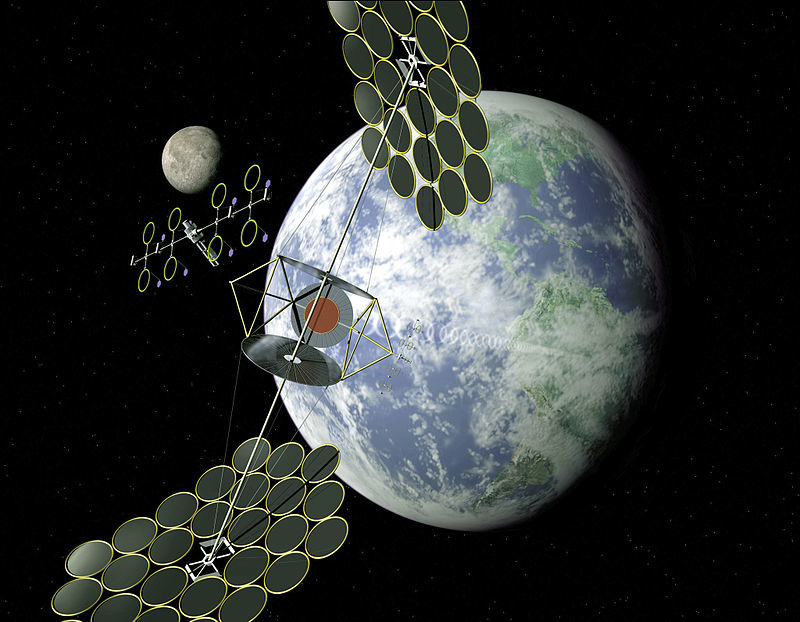 Additionally, the company—along with Japanese Aerospace Exploration Agency—is heavily involved in the development of other core technologies that may someday be used in space solar power systems (SSPS). Japan may be the third largest consumer of electricity in the world, but it famously possesses few of the natural resources commonly used to generate large volumes of electricity. Historically, in order to meet the demand, the country has turned to nuclear power stations, and imported oil and natural gas. But skyrocketing oil prices, and, more recently, a nationwide backlash against nuclear power, which follows the Fukushima Daiichi incident, has left the country scrambling for alternative power sources. SSPS could be a good alternative. Clear of the intervening nature of Earth’s atmosphere, solar panels are free to absorb more power from the photons hitting them. Atmospheric absorption cuts the amount of solar energy that reaches the Earth’s surface by half. Putting the solar panels in space also does away with pesky efficiency-reducing problems like clouds, dust and even bird droppings. But microwave power transmission isn’t without complications. For starters, the antenna arrays used to capture power and beam it back to the surface require a lot of space. Alternatively, the beams used to transmit the power would need to become more concentrated and powerful and thus, potentially, more dangerous in the event of accident. There’s also the inconvenient issue that most transmission testing has occurred within the 2.4 Ghz to 5.8 Ghz frequency range: smack in the middle of frequencies now in almost ubiquitous use for everything from cellular phones, to computer wifi transmissions. Nonetheless, laser-based transmission—the other major alternative—has its own problems, and microwave power transmission may also be poised to aid in other applications, where stringing cable is expensive or too complicated. Offshore wind or tidal generating grids, for example, could beam the output of microwave power transmission systems ashore.